Asian companies have had an impressive run in recent years, raising their profiles in the global marketplace. Now that 2018 -- the year of the dog -- is upon us, can they maintain their momentum as new technologies like artificial intelligence and electric vehicles transform the world economy? Will some find themselves unable to rise above, well, underdog status? With such questions in mind, the Nikkei Asian Review selected nine business people from across the region who are worth watching in the coming year. Mukesh Ambani, the Indian billionaire behind oil-to-telecom conglomerate Reliance Industries, has shaken up the hypercompetitive wireless market with mobile venture Reliance Jio Infocomm. In 2018, all eyes will be on Reliance Jio's next moves. The telecom company's launch in September 2016 triggered an intense price war with existing players like Bharti Airtel, Vodafone India and Idea Cellular, unleashing a wave of consolidation. Reliance Jio made a splash by offering free voice calls and no-charge data up to March 31. The venture now counts some 150 million subscribers, and though it started charging in April, its ultralow-cost 4G data plans are expected to keep drawing customers in the coming year. That said, the company might adjust its pricing, sending ripples through the industry again. "Whether Jio remains the huge dominant driver in 4G growth remains to be seen," OpenSignal, a U.K. company that specializes in wireless coverage mapping, said in a December report. "After a year of free and steeply discounted data pricing, Jio may make 2018 the year it raises prices. That could level the playing field for India's operators." But perhaps the biggest focus in 2018 will be Ambani's relationship with his younger brother, Anil Ambani, the chairman of heavily indebted Reliance Communications. Anil presented a revised debt resolution plan in December that includes withdrawing from the consumer wireless business and unloading assets, such as real estate. On Dec. 28, the two Ambanis announced the signing of definitive binding agreements under which Reliance Jio will acquire Reliance Communications' wireless assets, including fiber optics, spectrum and telecom towers. Reliance Jio emerged as the successful bidder in a two-stage bidding process, and the transaction is expected to close in a phased manner between January and March, subject to government and other regulatory approvals. Mukesh sees Jio as much more than a telecom company. With artificial intelligence and blockchain technology, he said it has a chance to digitally reinvent all sectors of the Indian economy -- from entertainment, financial services and manufacturing to agriculture, education and health care. "Can Jio be the first company to transform an entire nation in each one of these sectors? Yes we can, and we will." Suphachai Chearavanont is the youngest of Thai billionaire Dhanin Chearavanont's four children, but he has the highest profile. And 2018 may be the year in which he steps out of his father's shadow. Suphachai, 50, in January 2017 succeeded his father as chief executive of Charoen Pokphand Group -- the family's agribusiness, retail and telecommunications empire. Dhanin remains senior chairman, but he is preparing to pass the baton, with a plan to withdraw from all his roles in 10 years' time. "There are lots of things I have to learn from my father," Suphachai told the Nikkei Asian Review in January, just after his promotion. He was frequently seen attending group events with Dhanin in 2017. Suphachai had been chief executive of CP's telecom arm, True Corp., since 1999. He built the company into the country's No. 3 mobile carrier, overtaking Total Access Communication through aggressive adoption of new technology. Despite being a latecomer to the industry, True was the first to offer Apple's iPhone and the first to launch a 4G network in Thailand. Dhanin seems to be banking on Suphachai making the most of that experience. CP's midterm vision for the next five to 10 years, unveiled by Suphachai in May, calls for becoming "an organization driven by quality and advanced technology." The group will focus on logistics, robotics and biotechnology. "If we don't change, we will be out of service," Suphachai told local media in May. "Because everything is changing at a very fast pace." Aireen Omar, hitherto AirAsia's executive director and CEO of Malaysian operations, has a new role and a new goal: transforming the budget carrier into a "digital corporation." Aireen has been promoted to deputy group CEO -- a newly created post -- effective Jan. 10. The 44-year-old will assist Group CEO Tony Fernandes, taking charge of nonairline operations, including online payment service BigPay, duty-free shopping site ROKKIShoppe.com and in-flight catering business Santan. The former corporate banker will continue to lead risk management and government affairs under the group's corporate services. Her appointment is part of Fernandes' growth plan for the next 10 years, which includes monetizing AirAsia's vast customer database. He is creating an investment holding company that will eventually include AirAsia as a pure-play budget carrier, along with other subsidiaries. Aireen is one of the few women who have broken the glass ceiling in the airline industry. She joined AirAsia in 2006 as a director of corporate finance and was promoted to a CEO-level position in 2012. Drawing on a background in trading equity derivatives during a stint at Deutsche Bank Securities in New York and London, she helped AirAsia raise funds with innovative financing structures during the credit crunch of 2009, allowing the carrier to expand its fleet. A veteran of the U.S. tech industry is set to shape the future of Samsung Electronics in 2018. Chief Strategy Officer Young Sohn, a native of Seoul, studied electronics engineering at the University of Pennsylvania and graduated from the Massachusetts Institute of Technology's Sloan School of Management. Now 61, Sohn is based in Silicon Valley and is leading the conglomerate's mergers-and-acquisitions strategy. His goal: find new growth engines. Sohn was behind Samsung's $8 billion purchase of U.S. automotive and audio electronics company Harman International in 2016. He appears to be weighing additional deals for 2018, and told Reuters in December that he is interested in the auto, digital health and industrial automation sectors. He is a unique presence at Samsung, as one of the few executives with connections in the global M&A market. Before he joined the group in 2012, he worked for U.S. tech companies such as Agilent Technologies, Quantum and Intel. With Samsung's heir apparent, Vice Chairman Lee Jae-yong, serving a five-year prison term for embezzlement, Sohn's leadership will be crucial as the conglomerate attempts to step beyond semiconductors, smartphones and home appliances. Co-founder of a digital device company that makes laptop and peripherals coveted by serious gamers worldwide, the 40-year-old Singaporean entrepreneur -- and avid gamer himself -- Min Liang Tan made numerous headlines in 2017. His company, Razer, made its debut on the Hong Kong Stock Exchange in November, with its initial public offering coming in at a price near the top of the company's desired range, backed by strong interest from retail investors. Tan, who is said to be a billionaire following the IPO, was already eyeing new opportunities before the share listing. In August, he tweeted to Singapore's Prime Minister Lee Hsien Loong that he could devise a plan to unify the city-state's fragmented mobile payments market within 18 months, making it easier for people to make transactions. The prime minister responded, saying he would study the idea "seriously." Three weeks later, Tan and his team wrote up a full proposal. While the plan can be adapted to other mobile payment systems, Tan made sure to highlight his company's version, RazerPay. All eyes are on Tan to see whether he can pull off a coup in Singapore and Southeast Asia's fiercely contested mobile payments market. Indonesian tycoon Erick Thohir made international headlines more than four years ago when he took over storied Italian soccer club Inter Milan. After selling his stake in the club to China's Suning Commerce Group in 2016, he is now tasked with enhancing his own country's sporting prowess as head of the organizing committee for the next Asian Games. The games will be held in Jakarta and the South Sumatra province of Palembang this coming August. 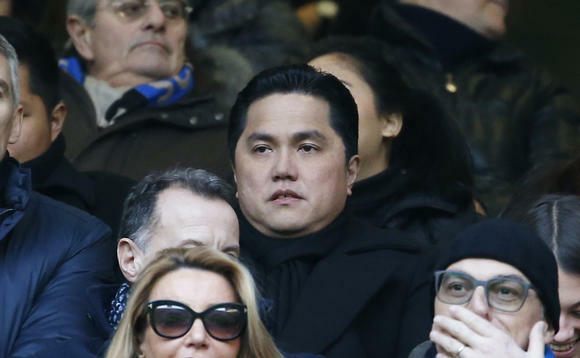 And Thohir, who remains Inter Milan's president, faces an uphill battle in his new role. Indonesia -- the world's fourth most populous country -- ended the 2017 Southeast Asian Games with 38 gold medals, placing only fifth out of 10 countries. The showing reportedly infuriated President Joko Widodo, who called for a "large scale" evaluation of the nation's athletic shortcomings. Thohir is the younger brother of coal billionaire Garibaldi Thohir and owns Mahaka Group, a media conglomerate that runs TV networks, radio stations and newspapers. Steering the Asian Games to success could open up new doors for Erick in the country's burgeoning sports industry. The tycoon is already putting his soccer connections to work for Persib Bandung, a local club for which he serves as a commissioner. The team recently brought in a pair of players who once starred for the English Premier League club Chelsea -- Michael Essien and Carlton Cole. As a smaller rival to Hon Hai Precision Industry, better known as Foxconn Technology Group, Tung Tzu-hsien's Pegatron usually gets orders from Apple to assemble low-end iPhone models. Yet Tung has higher ambitions for his Taiwanese group. Like Foxconn, Pegatron relies on Apple for more than 50% of its total revenue. Now, Tung is pushing Pegatron subsidiary Casetek -- which makes metal backs for iPads -- to improve its technology and win iPhone orders as well. Currently, Pegatron assembles iPhones using metal casings and frames procured from Catcher Technology, a bigger competitor to Casetek. But 2018 might be the year Casetek finally supplies backs for iPhones, if Apple decides to release an iPad-like handset sporting a liquid crystal display and metal back, as the Nikkei Asian Review has reported. This would help Tung's group emulate Foxconn's business model -- supplying metal casings and frames for iPhones while offering assembly services -- and start to close the gap. Supplying metal iPhone backs would likely boost Pegatron's bottom line, too, as the components offer better margins than assembly. Once a low-profile businessman from the city of Davao in the southern Philippines, Dennis Uy became the country's most acquisitive tycoon in 2017. He took over at least seven companies in different industries, while securing large loans and snagging a casino permit. What changed? The rise of President Rodrigo Duterte, whose successful campaign in 2016 was partly financed by Uy. 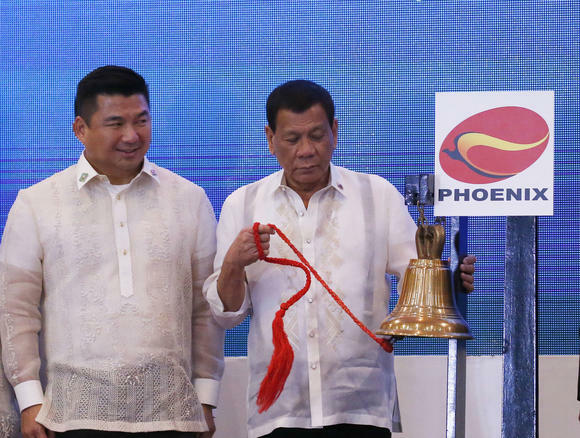 The tycoon behind Phoenix Petroleum Philippines insists he receives no special treatment from the Duterte government, but he did say he feels more confident investing with Duterte in power. Now, after his audacious deal-making in 2017, Uy is expected to lay out a growth road map in 2018. His group is to launch a new mini-city project in Clark Freeport Zone outside Manila, which is intended to become a new business district. The construction of Uy's casino in Cebu will also be in full swing. And investors will be watching how he nurtures FamilyMart Philippines, the convenience store chain he bought from Ayala Land in October. Uy recently acquired a shell company as well -- an entity that is likely to serve as a backdoor listing vehicle for one of his companies. With Duterte still calling the shots in Manila, Uy seems unlikely to settle for a quiet year. 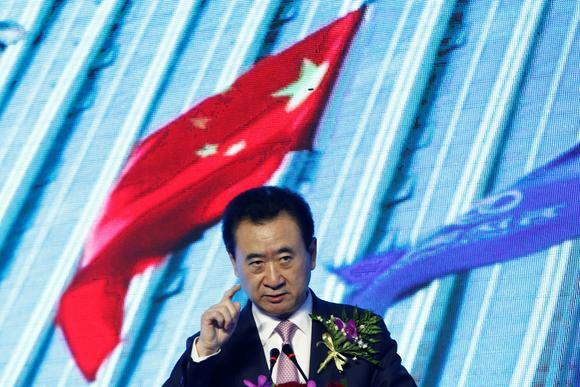 Dalian Wanda Group Chairman Wang Jianlin is coming off a roller-coaster year -- and 2018 may be just as dramatic, if not more so. The property mogul started 2017 as a force to be reckoned with in both global soccer and Hollywood, while grabbing land at home to build theme parks that might one day beat Disney. But his grand plan hit a wall during the summer, when his conglomerate abruptly sold 13 cultural projects and 77 hotels to two rival Chinese developers, Sunac China and R&F Properties, for $9.3 billion. The sales came amid Beijing's crackdown on capital outflows. And since then, rumors have been swirling around the Dalian-based group, including talk of an executive exodus, political pressure and a cash crunch. The Chinese tycoon will be looking to clean up the mess and get back on track in 2018. His success may hinge on three questions. The first is, what will happen to Wang's trophy overseas assets if he fails to win Beijing's blessing? After several high-profile acquisitions, including a 20% stake in Spanish soccer club Atletico Madrid, his global shopping spree came to a sudden halt. China's bank regulator described some of Wanda's investments as "irrational" deals that had burdened domestic lenders with "systemic risk." It will be difficult for Wang to make further inroads abroad without the nod from the authorities. On the contrary, he is under growing pressure to sell the assets to cover offshore loans. Second, will Wanda's property arm return to the A-share market before a looming deadline? When Wang offered $4.4 billion to privatize Hong Kong-listed Dalian Wanda Commercial Properties in 2016, he was hoping for a richer valuation from mainland investors. But the listing process has not gone smoothly, and if Wang fails to complete the move by the end of August, the company will have to repay shares to existing investors with 10% to 12% annual returns. Finally, is Wang still willing and able to pour money into his Hollywood dream? In 2013, he pledged 50 billion yuan ($7.64 billion at the current rate) to create China's answer to Hollywood in the eastern city of Qingdao. He flew in megastars like Nicole Kidman and Leonardo DiCaprio to witness the groundbreaking for Oriental Movie Metropolis -- a 200-hectare complex that will feature film production facilities, theme parks and luxury hotels. The complex is expected to fully open in 2018, one year behind schedule. But with Wang facing fundraising challenges, will he be able to deliver? Authors: Nikkei staff writers Kiran Sharma in New Delhi, Yukako Ono in Bangkok, CK Tan in Kuala Lumpur, Kim Jaewon in Seoul, Tomomi Kikuchi in Singapore, Wataru Suzuki in Jakarta, Debby Wu in Taipei, Cliff Venzon in Manila and Nikki Sun in Hong Kong.